PracticeLink.com W INTER 2019 21 Family Medicine Physician OPPORTUNITY Sign-on and retention bonus Great work-life balance Loan repayment options No call Tess Johnson | 888-700-6966 tjohnson@southcentralfoundation.com southcentralfoundation.com/physicians Alaska Native People Shaping Health Care IT ALL HAPPENS Equal Opportunity Employer - Minorities • Females • Protected Veterans • Individuals with Disabilities 7 hospitals | 680+ physicians | 240 practice sites | 24 GME programs If truly caring for patients and making a difference in the community is the reason you became a doctor, then join us in Virginia's Blue Ridge Mountains. You will feel right at home here with us. 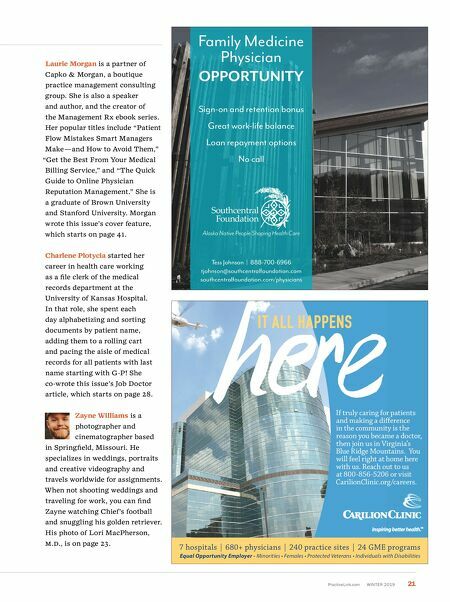 Reach out to us at 800-856-5206 or visit CarilionClinic.org/careers. Laurie Morgan is a partner of Capko & Morgan, a boutique practice management consulting group. She is also a speaker and author, and the creator of the Management Rx ebook series. Her popular titles include "Patient Flow Mistakes Smart Managers Make — and How to Avoid Them," "Get the Best From Your Medical Billing Service," and "The Quick Guide to Online Physician Reputation Management." She is a graduate of Brown University and Stanford University. Morgan wrote this issue's cover feature, which starts on page 41. Charlene Plotycia started her career in health care working as a file clerk of the medical records department at the University of Kansas Hospital. In that role, she spent each day alphabetizing and sorting documents by patient name, adding them to a rolling cart and pacing the aisle of medical records for all patients with last name starting with G-P! She co-wrote this issue's Job Doctor article, which starts on page 28. Zayne Williams is a photographer and cinematographer based in Springfield, Missouri. He specializes in weddings, portraits and creative videography and travels worldwide for assignments. When not shooting weddings and traveling for work, you can find Zayne watching Chief's football and snuggling his golden retriever. 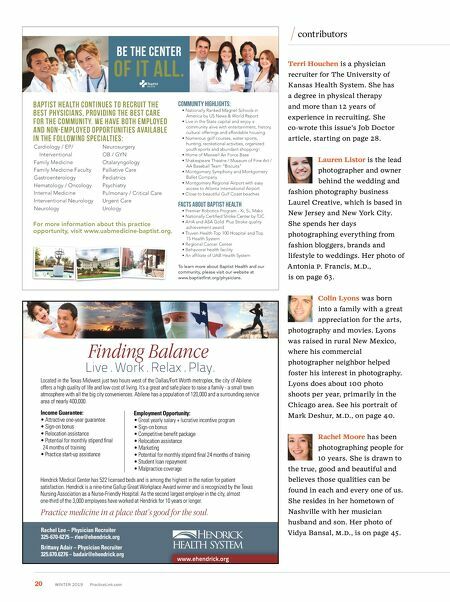 His photo of Lori MacPherson, M.D., is on page 23.